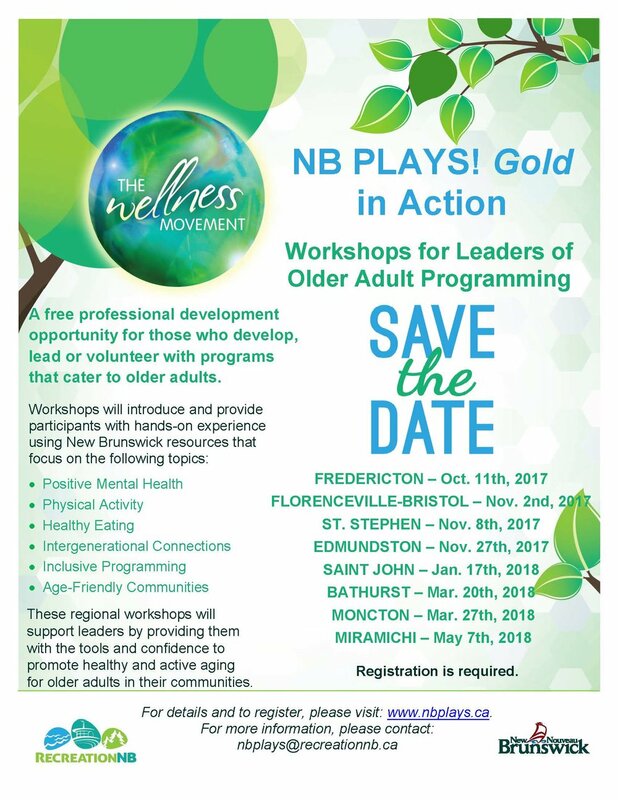 Gold Workshops — NB PLAYS! Workshops for those who develop, lead or volunteer with programs that cater to older adults. Do you work with older adults in a professional or volunteer capacity? Are you interested in promoting healthy and active aging in your community? Would you like to learn more about New Brunswick organizations and resources available to help support your work? If so, join us for a hands-on learning opportunity aimed at promoting wellness and healthy aging in New Brunswick. NB PLAYS! Gold in Action will highlight New Brunswick-made resources and programs, and build capacity among those who work with older adults in our province. These regional workshops will motivate and support your work by providing you with the tools and confidence to promote healthy and active aging in your community. Please sign up for a workshop near you at least one week prior to the workshop date. Space will be limited. Lunch will be provided. Please, let us know if you have any special dietary requirements or allergies. Please, let us know if you have any mobility issues or concerns about the accessibility of the workshop facility. Why are you interested in attending this workshop? NB PLAYS! Gold in Action is a New Brunswick-led initiative developed by Recreation NB and its partners. It supports recreation leaders and others who work with older adults, formally or informally, and strengthens capacity for programming that fosters health and wellness in our province. This project is funded by the Government of New Brunswick.